This Winter there will be no Frozy Camp but instead there will be a "Frozy Training", which is a one day event taking place in Helsinki. Nanbudo is promoted and preserved by the Finnish Nanbudo Federation (in Finnish: Suomen Nanbudoliitto). Within these pages we are trying to offer information about the martial art, training and events in the languages of Finnish and English. No Winter without the Frowzy Camp. This year the Frowzy Camp will be organised exceptionally in Helsinki, but as it is a Frowzy Camp, it will not be any warmer than the previous locations elsewhere. The training locations are revealed as soon as the previous training session is finished. The first training session will be held in the Töölö Sports Hall (Töölön Kisahalli). It has soon been ten years from the moment when practising Nanbudo began in Finland. To honour this journey, there will take place a ten year anniversary seminar in the September 2011. The instructor for this seminar will be the founder of the art, Yoshinao Nanbu doshusoke, 10 dan. 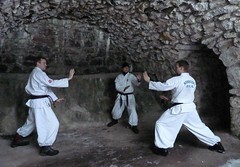 Once in while, approximately in every second month, there is an intensive day of Nanbudo training. The venue is most often in either of the two capital cities of Finland, Turku or Helsinki. This week the training will be in Saturday, 10th July 2010, and the venue will be in the surroundings of the Central park and "Kisahalli" in Helsinki. 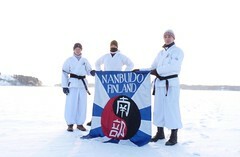 The traditional winter seminar of the Finnish Nanbudo Federation was in January 2010 in Rymättylä. There were as many as five participans from Finland and Slovenia altogether. A story about the seminar written by Slovenian visitor can be found from Seminars page. The national team of the Finnish Nanbudo Federation now has its own group in the Nokia Sports Tracker. Turku Nanbudo Club moves soon to the Summer training schedule. After this Summer the regular trainings are on a break until further notice. Summer training takes place outside. The first meeting takes place 4th June at 19:00 in front of the Turku Biological Museum (Neitsytpolu 1). 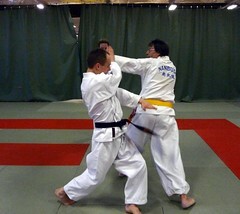 Training takes place in city's budohall at Virusmäentie 65, 3rd floor. New trainees are most wellcome to join us at the beginning of the season but jumping in later is not impossible either. Contact Kalle Lönnroth with email (kalle.lonnroth[at]gmail.com) or gsm (+358 44 260 1794) or come to see us in the trainings. The annual summer seminar of the Finnish Nanbudo Federation was held this year in the most southern populated place of Finland, a small island far away called Utö. The story of the seminar written by our youngest participant, Paavo, is available in the "Seminars" section. The reports of the seminars of which the members of the Finnish Nanbudo Federation participates, has got a new listing model. The reports are either written by people from abroad visiting the Finnish seminars, or Finnish Nanbudokas after visiting International seminars Worldwide. In Sunday 9th September at 20:00 we have a brief demonstration. The venue is Budohall of city of Turku in old Barker weaving mill house, street address Virusmäentie 65 (3rd floor, tatami 3). If you would like to start training nanbudo you are welcome to our group. It is a small one, so specific "beginners class" will not be organized; training times are same for all. The subjects of the training sessions will be selected in a manner that allows everyone to participate regardless the level of the trainer. The group will be divided when necessary. For a training equipment just some jogging pants and a t-shirt or equivalent outfit will do, training is done barefooted. Later one could purchase white Japanese style training suit (for example karate suit). Autumn season starts this week (week 33) and next sunday (19th August) we have our first normal schedule training. Croatian Jana Radic (1.dan) spent two weeks in Turku, from 6th to 18th August 2007. 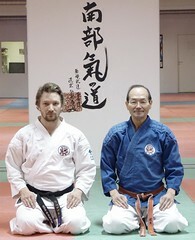 During this time she took over the trainings in Turku Nanbudoclub. Some extra trainings were organized. We saw quite a lot of new stuff and got some clarification to those that were uncertain to us. Croatian nanbudoka Jana Radic (1 dan) spent her time in Finland during weeks 23 and 24. The opportunity was not wasted as we arranged some extra trainings. The occasion turned out most usefull. We got some new perspective to our training and most of all boost to our enthusiasm towards utilizing the international aspect of this art in the future aswell.